'Chenille' (Keith Keppel, R 2010) Seedling# 04-20D. TB, 38" (97 cm), Midseason late bloom. Standards pinkish white (M&P 2-B-7) lightly shaded bishops violet (44-GH-10) at base; style arms cream (9-CD-1), lavender lip; Falls oyster white to marguerite yellow (10-BC-1) shading to flesh (11-A-2) toward shoulders; beards indian orange (1-D-12), very large and thick. 'Opposing Forces' X 'Roaring Twenties'. Keppel 2011. From Keith Keppel Iris catalog, 2011: CHENILLE ML 38" (Opposing Forces X Roaring Twenties) The kicker here is the wild beard, like a glorified strip from a chenille bedspread .. . or a big, fat caterpillar, which after all is what the French word means. 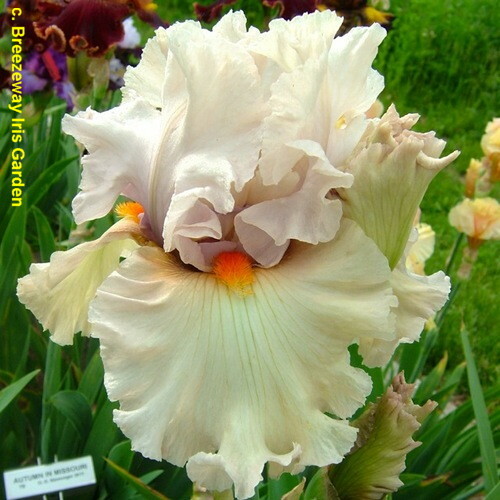 Lightly greyed pinkish white to cream petals,faintly undertoned soft violet, are lightly laced and ruffled. Fat, long beards are an almost glowing yellow orange to red orange color. Stems carry three branches and terminal, about eight buds, too short-branched for best show bench results, but perfectly fine for garden effect. Needs no label for identification! #04-20D. $45.00; 3 for $120.00.